Phillip and I cannot thank you enough. Everyone was talking about what a fabulous DJ we had. I think the club is taking an interest to add you to their list of preferred vendors. You might want to call and chat with them. I know they were very impressed with you as well. Thank you for helping us to create amazing memories. We are so happy we found you! Thank you so much for making our wedding such a blast. You were very professional from the first meeting until the end. We appreciate all the ideas that you gave us and for listening to us with what we wanted. Overall, it came out better than we imagined it. You made it seamless and easy for us to enjoy. Good morning Adam, I just wanted to drop you a line and say thank you for all you did at my husbands birthday, I know the party wasn’t a big deal, but having you made a HUGE difference. 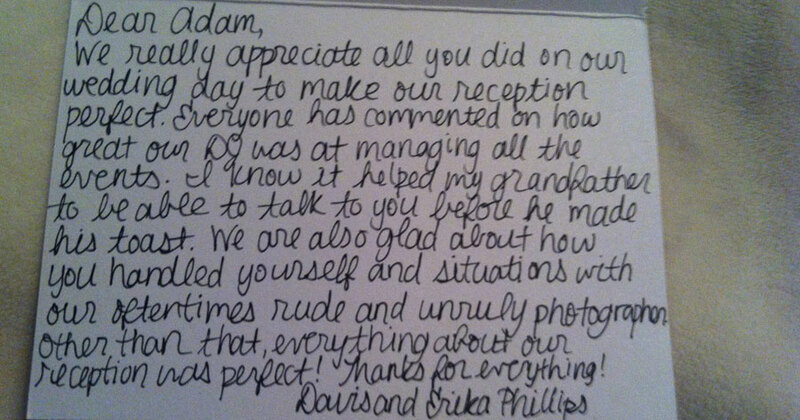 ALL of the guests commented on what great DJ you were and how nice you were, even when one of our guests was a bit unruly. The lights aded so much to the decor and I would highly recommend them to your future customers. Hi Adam! I just want to say Thank you!!!!!! Working with you really set our minds at ease. The biggest thing for us is that you always picked up our phone calls and made time to talk to us for even the smallest detail. Also we want to thank you for how you seemed to just step in an run everything at our reception. We had a lot of comments the day after on how great you were! From the first meeting with Charlotte DJ Company we knew we were in the hands of a professional with plenty of experience. Adam guided us through all the tricks and turns with our reception (which we knew nothing about!) He did such a wonderful job with everything! All of the music was perfect but the last dance and the fact that it was just us made the whole evening magical. Thank you for all of your hard work and we will definitely be recommending you to all of our family and friends.